I've been a fan of Rachel Maddow since way back in the hoary glory days of Air America, when she was just doing a radio gig. I knew even then that she was extry-special. So it doesn't sup rise me that she got a network show nor that she's currently mopping the floor with Sean Hannity (who's having trouble getting advertisers) but it galls me a little that Republicans have such little faith in their party platform that they won't go on her show and defend the ludicrous and insidious skullduggery that passes for conservative governance. At least ONE of them could appear on her show just to call EPA head Pruitt a fop-doodle or ninnyhammer or whatever term was popular a hundred years ago when they sold their souls to Satan. C'mon, Republicans. She's just a leetle girl. What are you skeered of? Sean Hannity, March 17, 20018: Hillary destroying her Blackberry was a crime! Sean Hannity, June 6, 2018: If you're being investigated by Mueller, destroy your cell phones! t-Rump: I'm pardoning Muhammad Ali. Courts: He was pardoned 47 years ago. t-Rump: Okay, then the NBA champs can't come to the White House. Cavs/Warriors: We weren't coming anyway. t-Rump: Asbestos is safe to eat. Everyone else in the world except Russia: Please go away. And this was all before 10AM today. (1) Russia likes asbestos. And Russian knows best. (2) Fat Boy HATED having to spend money removing asbestos from his renovated buildings. His solution was to tell everyone that guns don't kill people, uh, that smoking can't hurt you, uhhhh, that asbestos is safe. Yet somehow I imagine that if an envelope full of the powdered stuff landed on Herr Furor's desk (And I'm not suggesting anyone do this, okay?) his staff's immediate, full-on, lock-down, hazmat reaction would reveal just how idiotic his statement is. Technical note: After thinking it over I called a technical audible on today's 'toon. It used to say "Russian hush money" but I decided "our usual NRA bribes" was more accurate. You may now return to sharpening your pitchforks. 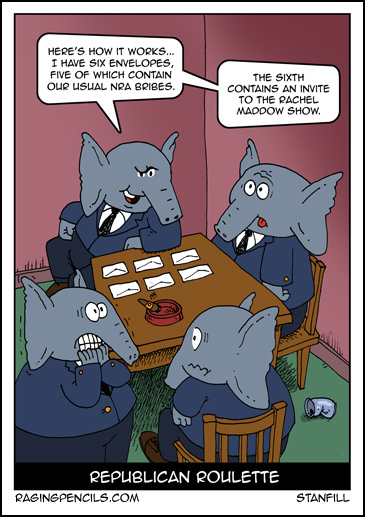 GOP elephants: Here's how it works. I have six envelopes, five of whiich contain our usual NRA bribes. The sixth contains an invite to the Rachel Maddow Show.